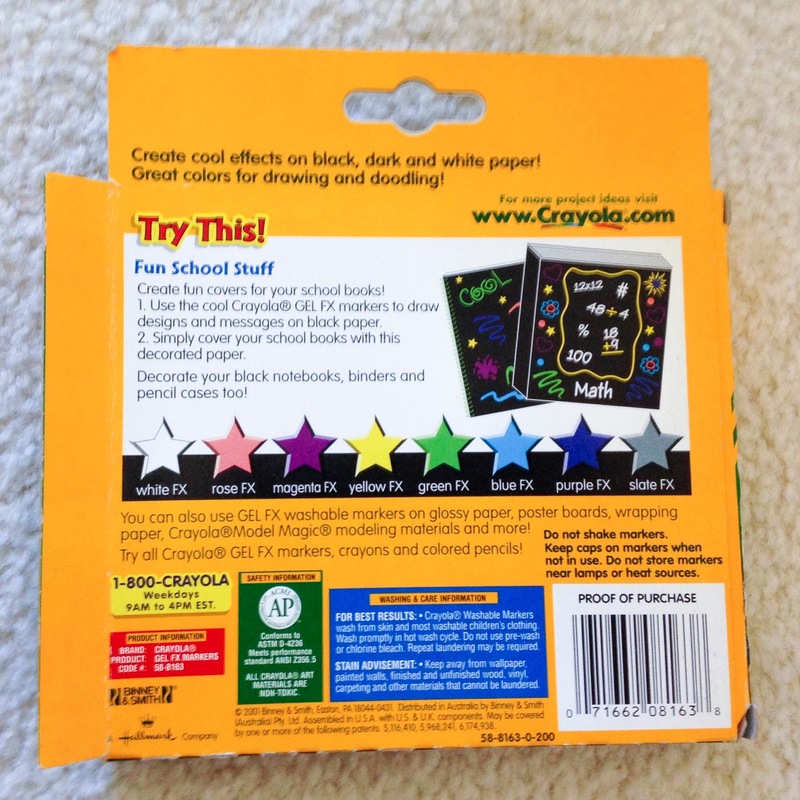 I love coloring on black and dark paper, and these Crayola Gel markers and Gel FX crayons make it super easy to do. When the strokes made on paper with the marker dry, the color lightens. This process can be seen visually and is very fun for kids to watch. 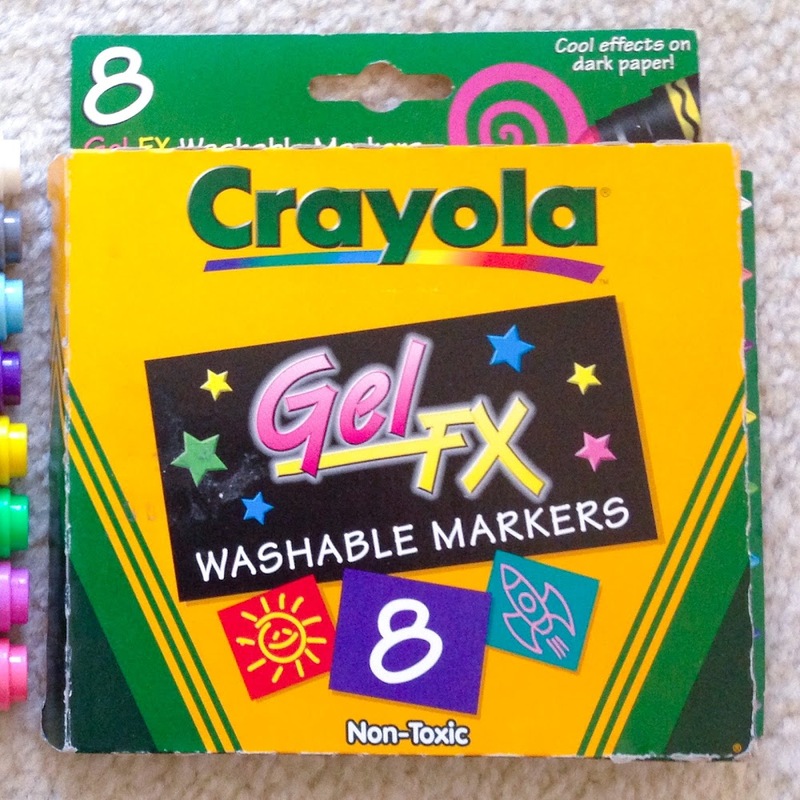 The Gel FX markers and crayons came out in 2001 and the markers are still being in 2015. Top markers by Stacy Hodges. I am so excited to also feature the crayon box from Stacy Hodges crayon collection. We found each other on the facebook group and she has a lot of Crayola products I do not have and has taken some pictures to share. I am so excited to feature some of her collection on the website along with mine! 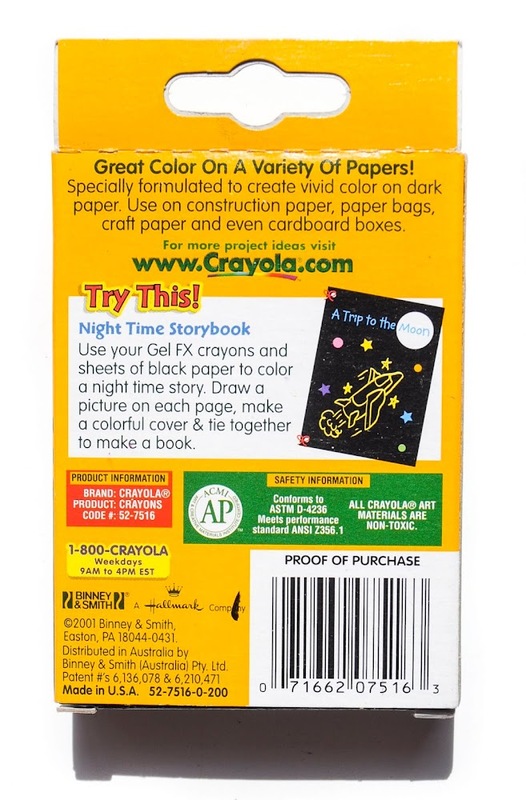 I wish I had some of my own crayons to try out, it sounds like they would be really fun to color with on dark paper. How do the markers work? According to the patent, the marker contains "submicron polymeric particles" which act as "opacifiers" which "modify and enhance the visual impact" giving them a "uniform opaque appearance". The markers turn lighter when applied to a surface. The marker also contains a "neutral buoyancy additive" "to prevent the submicron polymeric particles from settling out of the coloring composition". Basically, this means the marker does not need to be shaken before it is used. The buoyancy additive can prevent markers from dispersing on the paper. A "dispersant" is added to the markers to help the markers to counter this effect. The markers also contain a dye blocker to make them washable from skin and fabrics. How do the crayons work? The crayon is made up of wax, a fatty acid, a reflecting material, a defoamer, and a dye. The wax and fatty acid are usually paraffin wax and stearic acid, used in most crayons. The reflecting material, titanium dioxide makes the mark of the crayon opaque so it can easily be seen on dark paper. The dye used in this crayon is special and has "enhanced transparency and lightfastness" that "optimizes the reflective effect of the reflective filler so that the marking composition can produce bright and vivid marks" on the paper. The defoamer is probably used in all crayons and prevents pockets of air, The non reflective filler, usually talc provides strength to the crayon and is whiter than other fillers helping improve the mark on the paper. Crayons are made differently than makers, markers use a liquid to make marks and crayons use dyes that are infused in wax. It is really neat how Crayola makes the same product lines for different art supplies even though it requires different technology. 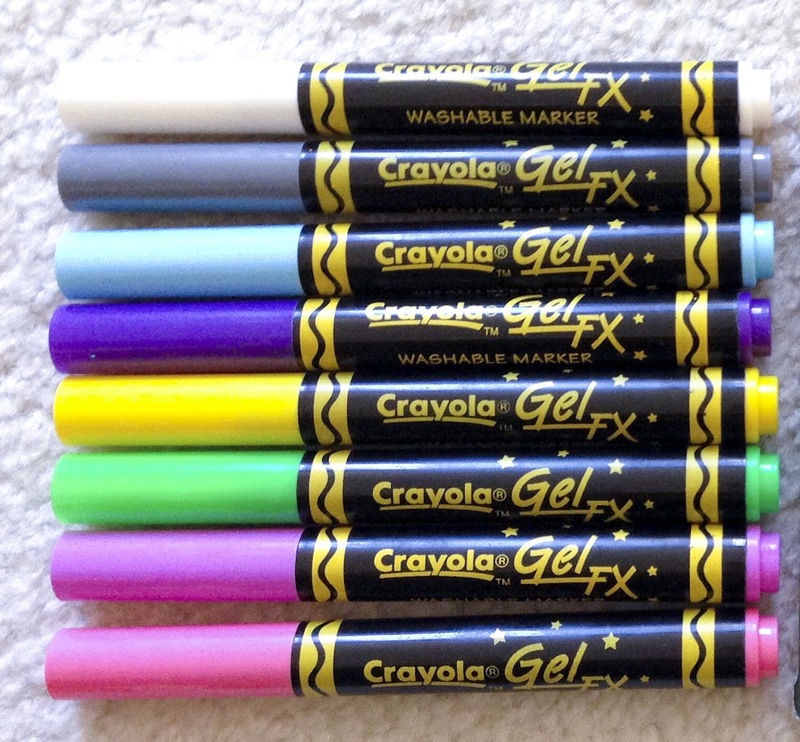 The only complaint I have about these markers and crayons is they do not have names. That drives me absolutely bonkers when they do not have names. Why did they go to all this effort in making them and then skip the naming step? The old marker boxes may be a little collectible, but are not that collectible because they are still in production and sold in stores. The crayon box is not in production and is becoming collectible. It is interesting to note both marker boxes have the same UPC. 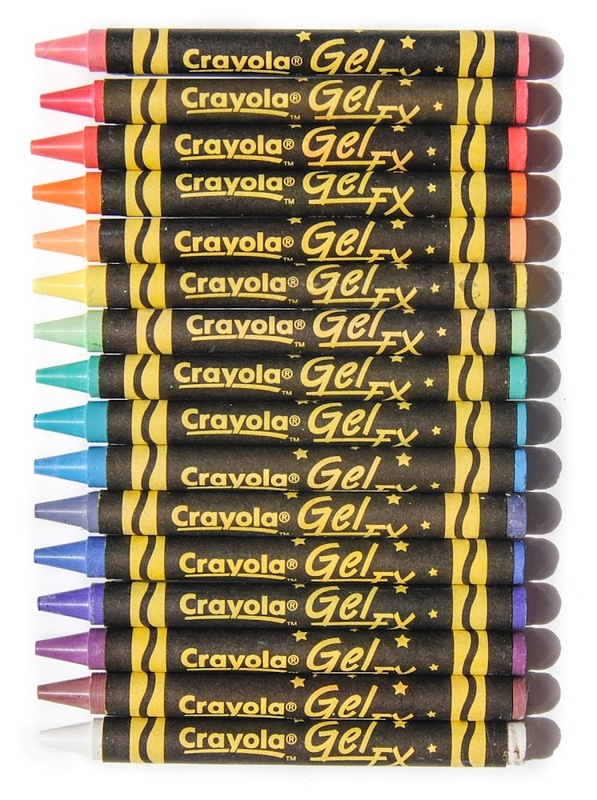 Where did you get the Gel Fx crayons? I broke the ones I have and have been looking everywhere for them on the internet. I just can't find them! I have some I will sell you. I have about 25 new boxes I am willing to sell. Just contact me. I will be putting them on eBay as well. 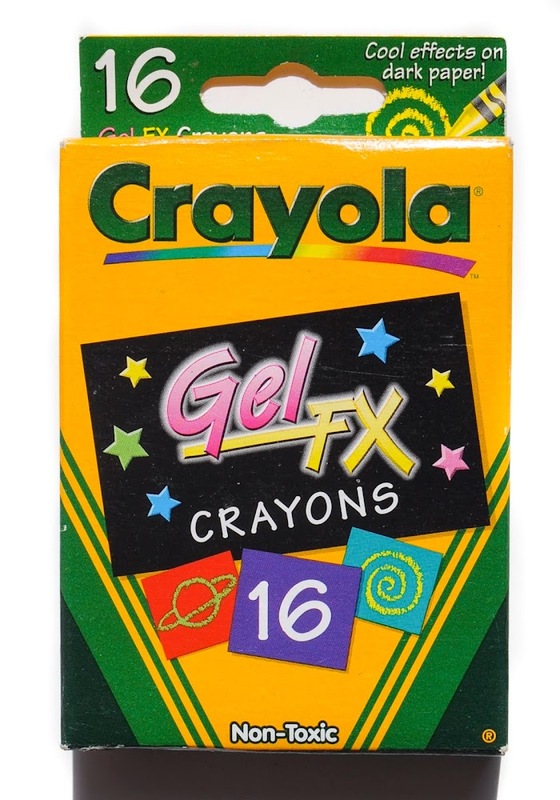 Are there any gel fx crayons left for me to purchase ? Where did you get the crayons?! I can't find them anywhere for sale on the internet. I broke mine and I need replacements ASAP. Please tell me they still exist somewhere! I don't have a box unfortunately and I don't think you can buy them anywhere. You could check ebay. This was the exact reason I started collecting crayons. Most recently I've found them on crayola's 96 box of crayons. Only a few colours but better than nothing. Stay up to date on your favorite coloring supplies. Leave your email to hear from me. Images on this website belong to Jennifer Crowther. They may not be used without permission. Jenny's Newsletter, Stay up to date on your favorite coloring supplies. Leave your email to hear from me.